Deerfield cycling has deep roots and began as a competitive entity in the 1970s. After a brief hiatus in the early 2000s the team was reborn in the spring of 2008 as an interscholastic varsity team. A member of the New England Prep School Cycling League, the squad competes in a long-standing series of races throughout northern New England. From individual time trials and circuit races to traditional road races, the New England League tests all riders’ abilities. The Pioneer Valley provides an incredibly versatile training ground, with flat roads stretching north and south and steep hills surrounding campus to the east and west. 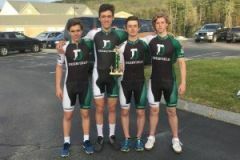 While Deerfield fields relatively small squads, the team has proven to be incredibly talented, with numerous podium finishes and stage wins. Historically, Deerfield cycling alumni have gone on to successful careers in cycling, including collegiate cyclists, domestic semi-pros, and a handful of professionals racing in Europe. Most importantly, Deerfield cyclists learn a strong sense of camaraderie and a love for the life-long sport of road cycling. After a stunning freshman year in which he won all but one race, Liam Holowesko returned for his sophomore year as team captain. 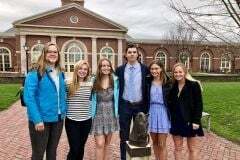 He led a small squad of four and although the team was young (2 freshman, 2 sophomores) the boys trained hard in April and were hungry for results when racing began. Holowesko started off where he left off last season and won all but one race (where he placed 2nd) including a dominant victory at the New England Championships. Freshman Alex Weinman proved to be a revelation and finished 4th overall in the New England individual standings. The boys went in to the final race of the year trailing Profile High School in the Class A standings but Liam’s victory and Alex’s 4th place finish propelled the squad for its first ever Class A New England Championship! Following the season, Holowesko added to his trophy case winning the US National Time Trial in June before racing for the US Junior National team in Europe where he won the prestigious Kercom Kermis! The future is looking bright for the team after losing no team members and adding several young, talented cyclists. If you are interested in joining a dedicated group of young athletes please contact Coach Calhoun at ecalhoun@deerfield.edu.